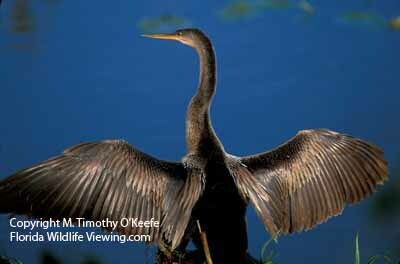 Anhinga, or water turkey, drying its wings. Birding in the Florida Everglades is some of the best where you might see as many as 300 bird species. The best birding season is from December to March. That's the winter dry season when birdlife concentrates mostly around the permanent bodies of water, which makes them quite easy to observe. This is by far the best time of year for birding. Mosquitoes are at their least bothersome, then, too. Royal Palm Hammock is on the left, just2 miles from the entrance. The half-mile longAnhinga Trail, the park's single most popular trail, is named for one of Florida 's most distinctive birds. The anhinga is also called the water turkey and snake bird, since it swims almost totally submerged with only its snaky-looking long neck and head above water. It captures food by diving underwater and spearing fish with its beak. The anhinga is the bird frequently spotted perched on a branch with its wings spread like it's in a state of alarm. The bird is actually drying its feathers. The anhinga lacks the oil glands needed to keep its plumage dry. If the anhinga didn't drip-dry itself regularly, it would become so water-logged it would sink. By February the birds should be concentrating around places like Paurotis Pond (named for the paurotis palms) and Nine-Mile Pond . Both are good sites for short-tailed hawks, osprey, herons, bald eagles and what many consider to be the emblematic bird of the Everglades --the roseate spoonbill. If you miss spotting a spoonbill here, look again at Mrazek Pond near Flamingo. Around the ponds, both migratory and the smaller resident cormorants, Caspian terns, mottled ducks and swallow-tailed kites may also be present during the day; look for limpkins and white-crowned pigeons early and late. When water levels are low, Mrazek Pond is one of the best places in the park for bird photography. The place is crowded with many different species. Because of its easy access, the flocks of birders can make it difficult to see the birds. Stretch your legs again at the two-mile long Bear Lake Trail. It passes through tropical woodland where you may find white-crowned pigeons and numerous landbirds. Unfortunately, the flamingoes are long gone from the small fishing of Flamingo, the gateway to Florida Bay and its mud flats. But keep an eye out for shorebirds, sandpipers, ospreys, egrets, pelicans and bald eagles in this area. The park's richness is mind-boggling: 2,000 species of plants, 51 types of reptiles, 17 assorted amphibians, 40 different mammals and an assortment of 347 avians.